Last weekend I attended Camp Blogaway, a food blog conference in the beautiful San Bernardino Mountains of southern California. Packed with useful blogging information, the conference featured sessions on search engine optimization, food styling, food photography, Google +, and cookbook publishing. One of the things I loved about Camp Blogaway was that it is a smaller and more intimate conference, giving attendees more of an opportunity to get to know each other. I’ve only attended two food blog conferences and I have to say one of the highlights of both conferences was meeting other bloggers and sharing ideas and experiences. We have so much in common with our fellow bloggers and it’s comforting to hear others share about the same successes, struggles, and balancing acts that we all experience. Pictured above are the Camp Blogaway attendees. One of my new friends from the conference, Katie Chin, is a chef, cookbook author, and fellow food blogger. Her latest cookbook, Everyday Thai Cooking, provides a beginner’ s roadmap to Thai cooking. She begins the book with basic cooking techniques and tips, followed by information on tools and utensils used for preparing Thai cuisine. The next section of the book contains photographs and information about ingredients used in Thai cooking. Subsequent chapters include basic Thai sauces; appetizers; soups; salads; poultry; beef, pork, and lamp; seafood; noodles and rice; vegetables and tofu; and desserts. Beautifully photographed recipes include Thai classics, such as as Chicken Coconut Soup, Green Curry with Prawns, Pad Thai, Panaeng Beef, and Lemongrass Chicken. Today’s post features Katie’s version of Thai BBQ Chicken. The marinade, containing lemongrass, garlic, fish sauce, and chilis, imparts classic Thai flavors into the chicken prior to grilling. The dipping sauce made with rice vinegar, palm sugar, shallots, Sriracha, and fish sauce provides the perfect sweet, savory, and spicy finish to the dish. Katie has offered to give away a copy of her cookbook to one lucky reader. Leave a comment before 11:59 p.m. on Sunday, June 1 to be eligible for the giveaway. I’ll use a random number generator to pick a winner. I love this cookbook and if you like Thai food, I think you will too. 1. Whisk together the garlic, pepper, fish sauce, sherry, sesame oil, palm sugar, lemongrass, chili, and honey. Place the chicken in a large sealable plastic bag. Pour the marinade over the chicken. Place in the refrigerator for at least 2 hours (up to overnight). Bring vinegar, palm sugar, shallots, chili sauce, and fish sauce to a boil in a small sauce pan over high heat, stirring to combine. Reduce heat to medium low and allow to simmer for 10 to 15 minutes. Remove from heat. Heat a grill to medium and brush with oil. Place the chicken on the grill skin side down and grill for about 15 minutes. Brush the uncooked side with the marinade then flip the chicken over. Grill the second side for about 15 minutes. Discard the marinade. When the chicken is cooked through (165 degrees internal temperature), transfer it to a serving platter and serve with dipping sauce. I grew up in small town Mississippi eating traditional southern fare.A lifelong foodie, I started cooking and experimenting with food at a very young age. I started Southern Boy Dishes as a creative outlet and a way to share my love of food. Blogging conventions are fun to attend, and it’s been a few years since I’ve been able to do so. I love meeting the faces behind the blogs, plus all the great classes (and food). I love the flavors of Thailand, especially coconut milk and lemon grass. This looks and sounds so flavorful. Great job! Bill, I just heard about Camp Blog Away for the first time about four months ago. How great that you went. I am sure your mind is bursting with new ideas. Love this Thai Chicken! That is the most gorgeous looking crispy chicken skin I’ve ever seen. This just looks and sounds perfect! Yum….I can’t wait to try this recipe. I love Thai food and the hubby loves thai barbecue so this should be a good one for the entire family. This sounds and looks delicious! Would love to win this giveaway! This is incredible!! This chicken is making my mouth water!! Thai food has become one of my faves but, similar to what others said, I rarely make it at home. I’ve tried but the recipes haven’t worked out as well as I had hoped. The chicken looks wonderful and I can almost taste it! This book might be what I need to turn it all around. That sounds like a summer camp worth attending! I love going to Thai restaurants, but oddly almost never cook it at home. This should change, and this book would be a great start. 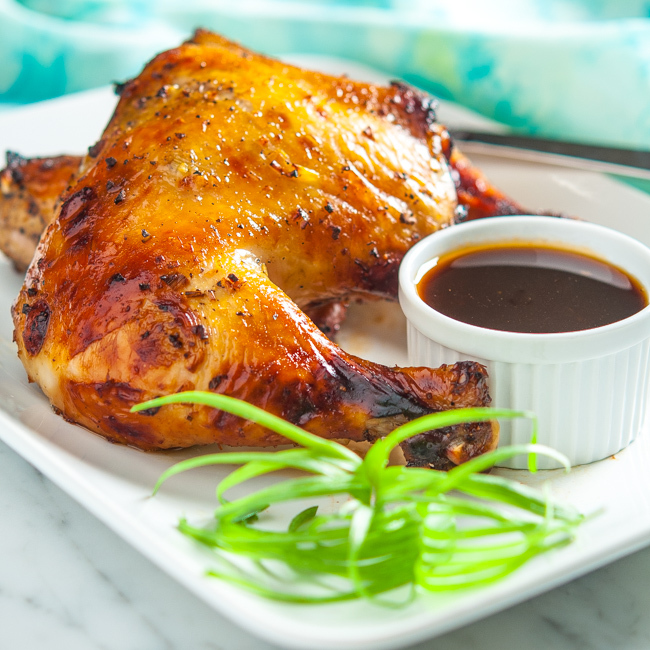 Love this recipe — great new take on BBQ chicken. Thanks for this. This BBQ chicken sounds great, and I bet the book is fab. Also I bet Camp Blogaway was a blast. I have heard so many good things about it and have been SO tempted to attend. This one was held right where near I live in Los Angeles. Sheesh! I think I missed the boat! Thanks for the opportunity to win the book. The combination of minced lemongrass, fish sauce and cooking sherry has me intrigued indeed! This chicken turned out beautifully – “Everyday Thai” sounds interesting – I love Thai but other than smothering everything with green curry paste, I am horrible at replicating Thai dishes!! Your Thai BBQ chicken looks amazing. When I read the list of ingredients including fish sauce, sherry, and dark sesame oil I knew it would have lots of flavor. We have grown to love dark sesame oil and keep a bottle in the refrigerator for salads and sauces. If this is a sample of what’s in Katie’s book, it must be a real winner. That looks delish and easy!! You are really taking over where your mom left off! Great legacy!!! Mmmmmmmmm!! Thai food is most definitely one of my favorite ethnic foods-Complex, yet light and off the chart delicious. Fantastic dish. I hope you got Google+ down everyone is using it, and I am struggling to figure it out. I need to dedicate more time to learning the bells and whistles. Love meeting and sharing with fellow bloggers and joining up with them in California is awesome too. This looks delicious! I’d love to win this cookbook! Yum I love thai food, especially the plethora of vegetarian options! Bill, Your Thai BBQ Chicken looks D’Lish ! Can’t wait to try it. Thank you. Oh my, that chicken looks divine! I love Thai food, and definitely need this cookbook in my library! It was soooo great to meet ya at Camp Blogaway, and look forward to your creations!! It was so nice to meet you at Camp Blogaway! Your photo of the barbecued chicken grabbed my attention this morning. It looks amazing! Will definitely try this recipe..thanks for sharing! I absolutely love Thai food and can’t wait to try this recipe!